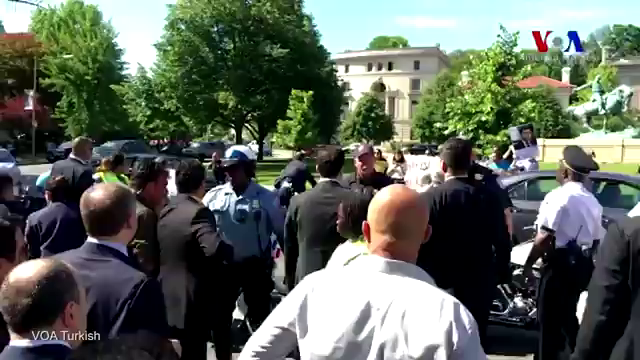 Turkish president’s bodyguards beat up protesters in D.C.
(by Chuck Ross, The Daily Caller) – Bodyguards working for Turkey’s authoritarian president, Recep Tayyip Erdogan, were involved in a massive brawl that left nine people injured outside of the residence of Turkey’s ambassador in Washington, D.C. on Tuesday, May 16. The melee, which was caught on video, occurred just after President Erdogan met with President Trump at the White House. Protesters critical of the Turkish government claimed that Erdogan’s bodyguards or security staffers working for the Turkish embassy launched the attack. Video of the fight showed men in suits kicking people, including women, some while they were on the ground. The footage shows some victims covered in blood. Aram Suren Hamparian, the president of the Armenian National Committee of America, filmed some of the incident and says he believes that the instigators were Erdogan bodyguards or security personnel working for the Turkish ambassador. Hamparian, who is highly critical of Erdogan, said that two dozen anti-Erdogan protesters, mostly Armenian and Kurdish, were protesting peacefully across the street from the residence. He said that the onslaught broke out suddenly. He says the videos show that the pro-Erdogan fighters appeared to be professionals of some sort. He also said they outnumbered the protesters. “It all took place at once. It was by very capable people. It felt to me, it looked to me like a highly orchestrated attack,” he added. Hamparian said that some Erdogan supporters were not violent. He said that he spent most of the night at the hospital with some victims of the attack. One man who Hamparian helped received between 10 and 15 stitches, he said. Another woman underwent a CT scan. Halil Mutlu, a cousin of President Erdogan’s and a board member of the Turkish American Steering Committee, was spotted on the sidelines of the fray. At one point he was seen leading a pro-Erdogan chant aimed at the government critics. Tuesday’s brawl harkens back to Erdogan’s visit to Washington, D.C. in March 2016. During a visit to the Brookings Institution, Erdogan’s bodyguards verbally and physically assaulted a group of protesters. “All of the sudden they just ran towards us,” Yazidi Kurd demonstrator Lucy Usoyan told ABC, adding that she was attacked by a pro-Erdoğan supporter. Tensions between Mr. Erdogan’s government and the Kurdish minority in the country are high. Erdogan met with Trump amid disagreements over Washington’s decision to arm the Syrian Kurdish YPG militia that Ankara regards as an extension of the outlawed Kurdistan Workers Party (PKK). Washington does not agree. The PKK has fought an insurgency in southeastern Turkey since 1984 and is considered a terrorist group by the United States, Turkey and Europe. A ceasefire between Turkey and the PKK ended last year and clashes have since claimed hundreds of lives on both sides. 2. Where was President Erdogan when his bodyguards attacked a group of people who were peacefully protesting against his policies? 3. What did video show? 4. Who were the people holding a protest against President Erdogan across the street from the Turkish Embassy in D.C.? 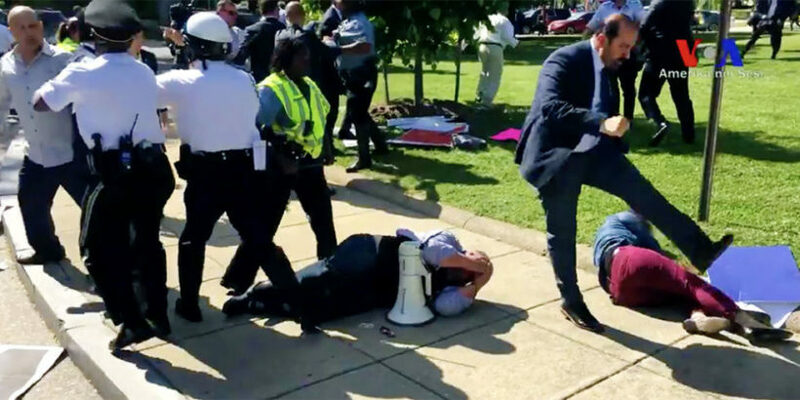 5. a) What previous incident were President Erdogan’s bodyguards involved in with protesters in D.C.? b) Considering this, do you think the D.C. Police Department made adequate preparation for Erdogan’s visit last week? Explain your answer. 6. Watch the videos under “Resources” below. That Turkish security forces violated the First Amendment rights of American protesters is, of course, a significant breach of international diplomacy. How do you think the U.S. State Department should handle this? Following the attack by President Erdogan’s bodyguards, the Turkish governemnt is demanding an apology from the U.S. According to Turkish pro-government media, which includes all mainstream newspapers and TV channels in Turkey, the video and U.S. news got the story wrong. In the Turkish state media version, “terrorist sympathizers and Kurdistan Workers’ party (PKK) supporters” had started to create trouble. Erdoğan’s bodyguards decided to intervene, they say, because US police were not able to adequately handle that situation.